Scottish filmmaker Kevin Macdonald follows up on his entertaining political films State of Play and The Last King of Scotland with a Roman-era, historical epic set in the Highlands of his mother country. The Eagle, a Focus Features release based on the late Rosemary Sutcliff's popular 1954 adventure novel, shows Macdonald to be skillful with elaborate battles, stunning landscape photography and period details. Unfortunately, the storytelling falters throughout and The Eagle, despite its grandeur, turns out to be Macdonald's most disappointing effort. 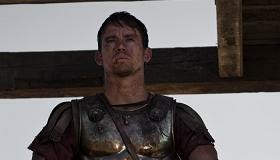 Some of the blame rests with Channing Tatum's somewhat bland performance as the film's heroic Roman soldier, Marcus Aquila. However much of the fault rests with screenwriter Jeremy Brock who struggles to build dramatic tension around Aquila's journey into dangerous lands. Arthouse regulars know Macdonald thanks to Last King of Scotland and his acclaimed documentaries Touching the Void and One Day in September. But Focus Features is giving The Eagle a wide, counter-programming push via 2,296 theaters on Valentine's Weekend no less. Expect box office to be soft, somewhat below State of Play, due to lukewarm reviews, poor awareness among female audiences and poor word of mouth. It's 140 AD and Roman soldier Marcus Aguila (Tatum) has come to take command of a small fort in Southwest Britain with the hope of restoring the honor of his father Flavius Aquila who twenty years earlier vanished with 5,000 soldiers of the Ninth Legion during a march into the rugged north country of Caledonia. More importantly, Marcus' father lost the Legion's legendary standard, the golden Eagle of the Ninth. After recovering from battle wounds, Marcus sets out to Caledonia to find the Eagle with the sole help of his British slave Esca (Jamie Bell). Deep into Caledonia, Marcus meets up with a former Roman soldier (Mark Strong) who knows the whereabouts of the Eagle. The problem is that the Ninth Legion standard lies in the possession of the dreaded painted tribe known as the Seal People and their lead warrior the Seal Prince (Tahar Rahim). Tatum, best known to mainstream audiences for his action role in G.I. Joe: The Rise of Cobra, looks great in his leather and iron fighting gear. However, he lacks the steely presence and larger-than-life personality to lift the drama around him and create the tension The Eagle sorely needs. Jaime Bell, soon to be seen as the adventurer Tintin in Steven Spielberg's 3-D adventure The Adventures of Tintin: The Secret of the Unicorn, enjoys the best entrance in the movie as he shows off his muscled physique fighting for his life in a gladiator's arena. For much of the film, Bell remains fairly soft-spoken as the British slave Esca. Finally, when he takes control of the action, his energetic turn is too little too late. The always reliable Mark Strong (Sherlock Holmes and the upcoming Green Lantern) makes the most of his brief role as Guern, a former Roman soldier on the Ninth Legion who gains a chance to redeem past behavior. The best performance belongs to French actor Tahar Rahim, star of Jacques Audiard's epic gangster drama A Prophet. Rahim shows off his chameleon talents and physical strength as the Seal Prince, a warrior in grey pigment who fights to his last breath to prevent Marcus from retrieving the Eagle. Thanks to Rahim, The Eagle has a worthy villain. Unfortunately, it's lacking in a quality hero. While The Eagle is a disappointing stumble for Macdonald it's still impressive to watch him make good use of the massive period sets, spectacular locations in Hungary and Scotland and complex battle scenes. Re-teaming with Anthony Dod Mantle (127 Hours, The Celebration), as well as production designer Michael Carlin and costumer Michael O'Connor (all three crewed together on Last King of Scotland), Macdonald is at his best when Marcus and Esca race across the Highlands with the Seal Prince in fast pursuit. In fact, O'Connor deserves special mention for his work in The Eagle. Whether designing Roman battle gear, the tribal clothing of the Seal People or the flowing robes worn by Donald Sutherland as Marcus' kind uncle, O'Connor's costumes are the best thing about The Eagle. It's a double shame that Brock's screenplay falters, especially with a closing scene between Marcus and Esca that's better suited for a buddy cop comedy. After all, The Eagle is Macdonald's Scottish homecoming. Still, Macdonald does prove himself to be skilled when it comes to large-sale Hollywood moviemaking. Next time, let's hope the script matches his talents. Rating: PG-13 for battle sequences and some disturbing images. How can open file explorer windows 10,here the available best way,now following this tips http://fileexplorerwindows.com i am sure you easy to open file manager application,then thanks for share this visit.